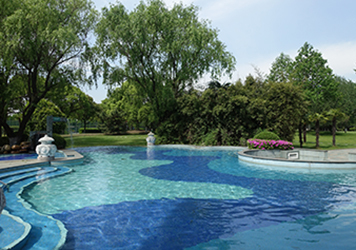 Visitor's first impression to The Emerald is always its magnificent view of spacious lawns and lush vegetations, a welcoming sight and distinguishes The Emerald from the other expatriate residential enclaves in Shanghai. Only at The Emerald you can find your own soccer field within a Villa compound, in addition to two large grass lawns for picnic. Across the large estate compound are dotted many more manicured gardens, scenic greenery path, little streams and fountains, including a Chinese pavilion to give that oriental touch. All these features entices one to feel and relax in nature. Our greenery and landscape planning provides spacious playgrounds for kids to play and interact with mother nature. It is also a place for adults to spend their relaxing weekend after a busy week of work. The lush grass lawn and tall wall of bamboo trees form a safe and comfortable oasis that lends relaxation to your morning breakfast, elegance to an afternoon tea. By night, the yard comes alive through recessed garden lightning. Occasionally the sounds of the running waterfall disturbs the tranquility.